Five years one-hundred and fifty-three days ago the Ontario Power Authority offered a feed-in tariff (FIT) power contract to Nigig Power Corporation for a 300 megawatt capacity industrial wind facility. The project now is referred to as the Henvey Inlet Wind Project. At the time the contract period was 3 years and the World Trade Organization was yet to rule against provincial sourcing of material. Some math might be of service for anybody capable of using math considering supporting Clement’s ambition is the Conservative Party of Canada – and perhaps even for Ontario’s new Minister of Energy, Glenn Thibeault, to recognize the damage he can do simply by ignoring the ratepayers interest in stale old contracts – as his predecessor did with this project. The Ontario Energy Board (OEB) has finally released Ontario’s System-Wide Electricity Supply Mix: 2015 Data. Previous years’ versions of this reporting have been almost unique in providing an indication of the costs of embedded generation. Although the OEB supply mix data shows only percentages by supply types, assuming all nuclear is grid-connected (Tx, or direct) generation, it’s reasonable to use the annual nuclear generation reported by the IESO (including curtailed nuclear) to calculate estimated generation from each source – and having done that to estimate the cost of the generation not reported by the IESO using estimated unit costs from Table 2 of the most recent OEB Regulated Price Plan supply cost documentation. There’s $1.35 billion in hidden solar costs here! Why is the IESO contracting more solar when the can’t provide any accounting on what they’ve already contracted? Today column is on the Premier of Ontario’s negligence. Three of my previous four posts at my Cold Air blog dealt with difficult topics that included capacity factor and capacity value/credit. The fourth post discussed statistics for the first half of the year. This post uses a small set of IESO statistics and first half-year generation with industrial wind turbines to display the economic damage of a collapse in value of incremental wind turbines. The first half of 2016 saw the second largest annual increase in wind. With average generating capacity up 711 megawatts (MW) over the first of 2015, the increase in output was only higher than in 2013 (which had only a 39 MW increase), and 2008, which had just a 70 MW increase. This past week Samsung and Pattern officially opened the Armow industrial wind facility. Today I ran my routines estimating curtailment at the province’s industrial wind facilities and found, for the second consecutive month, Armow topped the ugly list of sites ordered by share of potential generation curtailed. The large curtailment isn’t because Armow is a new site – it really isn’t. 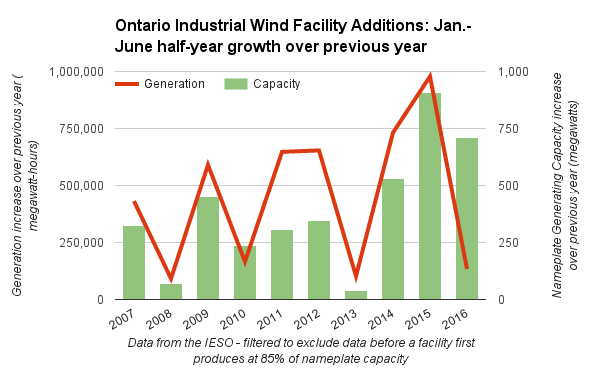 The party as June ended was surprising as the IESO’s most recent Hourly Wind Generator Output data file show the site producing electricity January 3rd. In hour 17 on January 17th the site first showed output above 85% of its nameplate capacity (180 megawatts). This is mark by which my routines treat sites as operational. In it’s news release on the start up of the facility (which wasn’t really near the start up of the facility) Samsung claimed, “Armow Wind is expected to generate enough clean energy to power approximately 70,000 Ontario homes each year, based on average annual residential energy use in Ontario.” I’ll return to this figure, but I don’t believe it was intended to generate any incremental power for Ontario homes. Samsung’s buying out of existing projects ranked lowly by Ontario’s contracting authority, utilizing guaranteed transmission space to block better projects owned by other suppliers. By August 2011, the Korean Consortium had acquired two low-ranked projects in the Bruce region that never stood a chance of obtaining a FIT Contract, but were nevertheless granted PPAs under GEIA [Green Energy Investment Agreement, a.k.a. the Samsung deal]. First, the Korean Consortium acquired the Armow project from Acciona, which was ranked 21st in the Bruce region. Second, the Korean Consortium acquired the K2 wind project from Capital Power, which was ranked 24th in the Bruce region. Armow is the most curtailed site the past two months, displacing from top spot it’s neighbour K2, also a Samsung property.